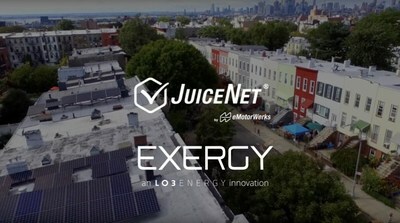 SAN CARLOS, California, Dec. 5, 2018 /PRNewswire/ -- eMotorWerks, a subsidiary of the Enel Group's new advanced energy services business line Enel X, and LO3 Energy, an innovative company that facilitates local energy marketplaces through advanced digital services, have launched a partnership to use JuiceNet's smart-grid control technology for a series of microgrid + EVs projects with the joint goal of exploring high-value use cases for local energy markets. Founded in 2010, and based in the San Francisco Bay Area, eMotorWerks is a subsidiary of the Enel Group's new advanced energy services business line Enel X, revolutionizing the EV charging market with its JuiceNet-enabled smart grid EV charging solutions. JuiceNet-enabled devices, such as the company's connected, high-power JuiceBox charging stations, maximize charging efficiency and speed while providing EV owners intuitive control and visibility. By shifting when and how much electricity JuiceNet-enabled stations draw from the grid, eMotorWerks helps utilities and grid operators reduce electricity costs, ease grid congestion, and maximize the use of solar and wind power. eMotorWerks is growing the EV charging ecosystem by partnering with EVSE and EV manufacturers to provide an extensive cloud platform for grid balancing and optimization for utilities. For more information on eMotorWerks, please visit www.emotorwerks.com. Follow us on Twitter (@eMotorWerks), on LinkedIn and Facebook.